It was on that date that the first ever article was published on Comics Gamers Assemble: a preview of the public demo for 2K’s The Darkness 2, a follow-up from the 2007 game developed by Starbreeze Studios. Since that time, over 900 articles have been published on this platform, ranging from reviews of games both old and new, features and editorial opinion pieces. When I started talking about the idea of crafting a site dedicated to just comic book video games, I was often met with some substantiated skepticism: won’t you eventually run out of things to talk about? While there certainly has been some time where content has not been as plentiful as I would like, there’s nonetheless been a lot to talk about, whether that’s new games, older ones I knew about that I wanted to cover and the best ones of all: those I knew nothing about whatsoever. On this milestone anniversary, I want to reflect on some of the highlights of the past five years that have deeply affected me and have helped me continue to keep writing here; even though at times I wanted to pull a Spider-Man and just give up and be content with consuming what other creators have put out into the world. 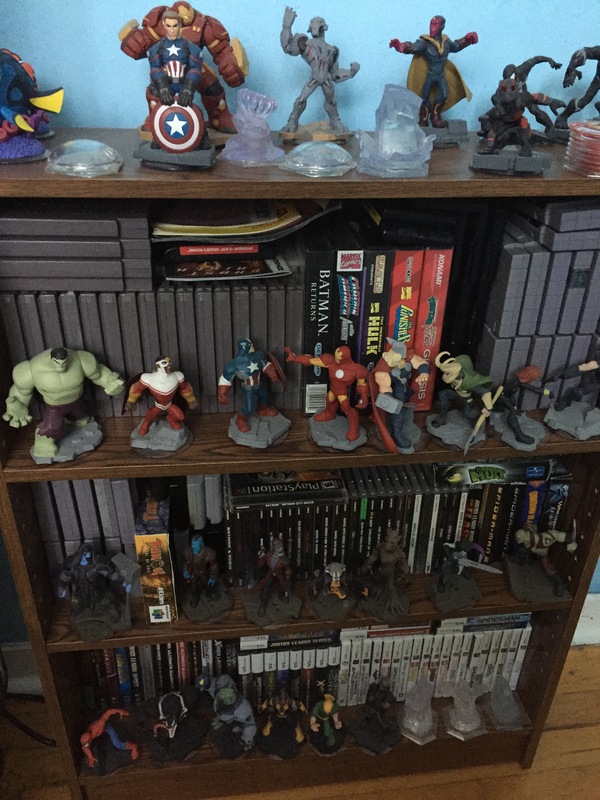 Since as long as I can remember, I’ve been collecting things: action figures, comics books, movies, but mostly video games. In the early days of planning Comic Gamers Assemble, the amount of physical games in my possession based on comic book properties filled up about half of a small comic book box. Since then my collection has grown to fill out a small book shelf that is absolutely packed full of retro games, two shelves of a larger book-case for games released over the past three generations (GC/PS2/XBOX upwards) and a binder of loose handheld game carts. Of course I also can’t forget the digital games taking up space on my various hard drives, some of which have become more invaluable than the rarest games in my physical library do the fact that you can no longer legally purchase them like Scott Pilgrim Vs. The World, X-Men: The Arcade Game as well as Teenage Mutant Ninja Turtles titles from both Ubisoft and Activision. In case you were wondering, I do indeed own all the games I’ve reviewed. 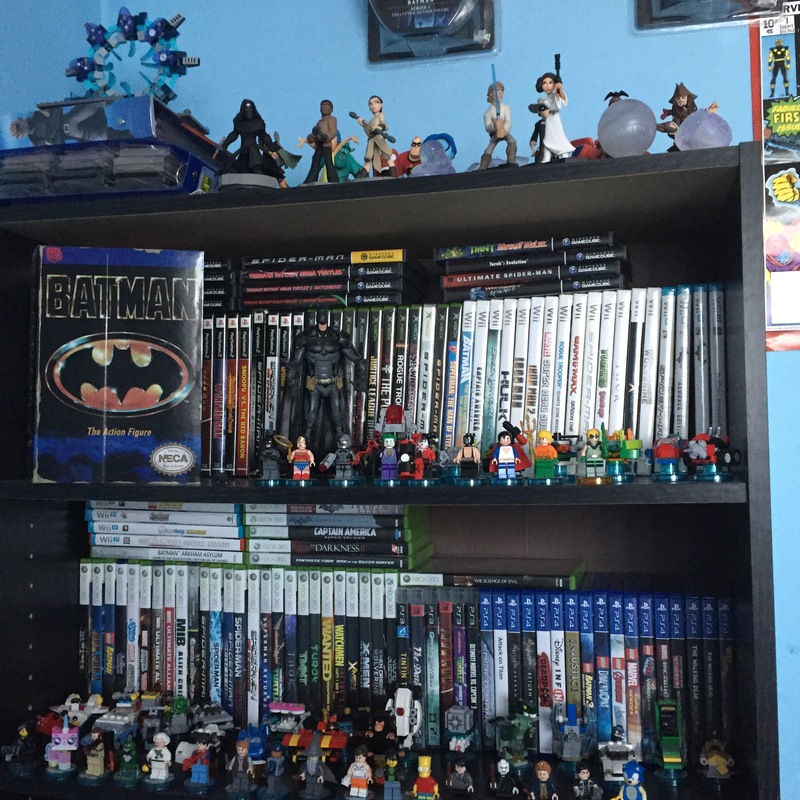 Though I like to collect games and see them accumulate on my shelves, games are meant to be played after all and not displayed. While I certainly at times have wanted to pull out my hair over some of the games I’ve reviewed for this site, those instances are far outweighed by the amount of pleasant surprises I’ve had the chance to experience. I like to think I know a decent amount about retro games from the systems I owned while I was growing up, but if not for this site, I probably would never had heard of games like Ex-Mutants and Dinosaurs for Hire. There’s also games like Rogue Trooper and Snoopy Vs. The Red Baron, games that came out very late in their respective console life cycles that I probably would never have even given a second glance to that have become some of my favourite games in their respective genres. Comic Gamers Assemble has also provided me the opportunity of finishing games that had me completely and utterly defeated back in the day, games like Teenage Mutant Ninja Turtles (NES), Spider-Man and the X-Men and The Death and Return of Superman. I’ve also joined a very small club I’m assuming of people who have finished Superman 64. On hard. 2015’s Year of Acclaim feature also gave me a new-found appreciation for the Acclaim comic book games of the N64 era like the original Turok: Dinosaur Hunter and the criminally underrated Shadow Man. In late 2015, D3 commissioned WayForward to port the free-to-play mobile hit Marvel Puzzle Quest to consoles and it was a game I sunk more hours into than I care to admit. Seeing as how most major gaming outlets were busy covering the big hits of the season like your Call of Duty‘s and whatnot, not many people were doing write-ups and coverage for Marvel Puzzle Quest. It was to my pleasant and humbling surprise to see a news article on D3’s website about outlets talking about their latest adaptation of the game and to see Comic Gamers Assemble quoted within the article. I’ve linked to the news piece HERE. Once a year over the course of a weekend in my home province of Newfoundland, Canada the Sci-Fi on the Rock convention is put off. People from all walks of nerd and geek culture come together to meet up, scour the tables of vendors, and partake in panels hosted by invited guests which in the past few years have ranged from voice actor Kirby Morrow (Mobile Suit Gundam Wing; Dragon Ball Z) to this year’s honoured guests of Tony Todd (Candyman; The Rock) and Doug Jones (Hellboy; Fantastic Four: Rise of the Silver Surfer). Apart from the celebrity guests, local people are also encouraged to pitch panels for the weekend and I was lucky enough to be selected last year. I’ve never been nervous of public speaking, but I will admit to having some doubts as to whether people would want to hear someone talk about comic book video games for close to an hour. The crowd for the panel I put off was small, but they seemed to be very receptive to the material I put together and the audience engaged with me in an excellent discussion about games like Spider-Man: Web of Shadows and Scott Pilgrim Vs. The World afterwards. I’m happy to announce that as of last Friday, it was confirmed that my request to do a panel at this year’s convention was also approved. I haven’t gotten the exact time it will take place over the convention weekend, but this years convention takes place between April 28th-30th. I will post an article for those who are local and wish to come out and see it when the precise date and time becomes known. Way back in the year 2002, I was about to graduate high school and I had to think about what came after that. My choice was to go to University because that’s what I thought people did though I didn’t really have any direction. Eventually I settled on business because arts students didn’t make any money (EDITORS NOTE: neither do business students I found out the hard way), and I wasn’t scientific nor athletic. It was in 2006 at the tail end of my program and many, MANY thousands of dollars in debt letter that I found out what I really wanted to do: write, discuss and talk about video games. I came to this conclusion after video and audio coverage of games via podcasts started to come around, more specifically the 1up Show. The 1up Show was a weekly program on the now sadly defunct 1up.com website where the staff of the site as well as that of the various magazines published by Ziff Davis like Electronic Gaming Monthly and Computer Gaming World had detailed conversations about all the new games coming out. It was one thing to know that there were people behind the articles of these sites and magazines, but on the 1up Show you got to see the authors behind the articles and get to know them. Your conversations morphed from “Well, EGM gave it an 8” to “Jeremy Parish gave it an 8” and that held so much more weight to it. People like Jeremy, Garnett Lee, John Davison, Dan “Shoe” Hsu, Bryan Intihar and Shane Bettenhausen among many, many more become my rock stars and I dreamed what it would be like to work within that office. As print coverage shifted to digital and game coverage moved away from more traditional sites to influencers on YouTube and Twitch, sites like 1up started to close down and become fewer and fewer, making it more difficult to work in that industry. In my years since graduation, I’ve never made a single dollar writing about games either on a site’s blog or here, but it has provided me the opportunity to interact with those who used to be in the trenches. Through social media I’ve interacted with Greg Sewart, formerly of EGM who know co-hosts the Player One podcast as well as Generation 16, a series about the games of the Sega Genesis, or Mega Drive if you’re from other territories. I’ve met Chris Baker, author of WRONG! Retro games, you messed up our comic book heroes! who actually worked for Marvel Games and has his name in the credits of a number of games that I’ve written about. There’s also a gentlemen by the name of Chris Clow whom I’ve met who also has a passion for comic book video games and covers them in his podcast Comics on Consoles as well as contributes to a weekly column on Movies.com about comic book characters in film. I’ve tried my hand at this several times: creating a user blog on 1up, Capcom, even trying to make my own game site that I haven’t touched in years, but it wasn’t until Comic Gamers Assemble happened that I got to meet any of these wonderful people. I’m not what you would call an excellent writer, but it’s pretty astounding for me to look back on my earliest review, The Punisher on the original Xbox and compare it something I wrote more recently like say, Batman: Return to Arkham. Covering games in any capacity is something that I’ve always dreamed about doing but has become more of a hobby as well as something I can use to exercise my brain at my monotonous day job. With each article I write I get a little bit better than the one before it and that’s a tick in the “Win” column for me at least. I’ve done this before in other reflective pieces, but I would like to take the time to give a huge thanks to the over 48,000 visitors who have stopped by, whether to read a piece of news, check out a review or engage in a discussion via a comment either on an article or social media. My numbers are very small and a hilarious fraction of say, a YouTuber’s daily reaction video and broken news is routinely scooped by bigger sites even if it is a day or two late, but just to know that someone out there is stopping by means a lot. Who knows how much longer I can keep this up as this is after all a more or less one man operation done in spare time, but if you found out about a game you never heard of or reconsidered one that you looked over because of something I wrote, that means just as much to me as any pay cheque that would come in.